At one time or another many of us harbour a wish to give up the town or the city and make their way to some distant island shore, usually populated by palm trees shading a white sand beach and tropical waters. On the western shores of Ireland we can’t quite offer that but we can offer tranquillity, beauty and space. Some of our islands, namely Inishbofin, Inishturk, Clare and Omey have permanent residents, the others may have had in the past like Inishshark, High Island and the Inishkea Islands. They all represent a magnificent location, either for a visit lasting a day or for substantially longer. On three of the populated islands there are both Hotels and Guest Houses and on all of these there are restaurants, cafés and pubs where one can enjoy some traditional hospitality, excellent food and no shortage of entertainment in the evenings. Day’s Hotel on the edge of the old harbour in Inishbofin is an excellent venue for lunch outside and a very comfortable location for a holiday, 095-45809. BATHERS: On their shores lie quiet and sheltered beaches such as East End Beach on Inishbofin. A crescent beach ringed by traditional cottages, soft sand and 100yds from the shore an excellent restaurant called ‘The Galley’ which also serves as a Guesthouse during the season, 095-45894. Because the islands are so small, it is possible to walk round all of them during the course of a day or at most two. 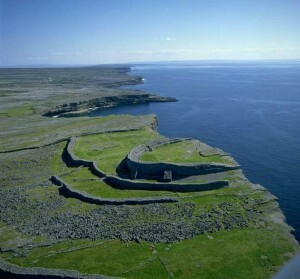 RAMBLERS: From their hill tops, islands such as Inishturk and Clare offer some breathtaking views where you will find the ruins of watch towers built there for similar purpose many centuries ago. Not far from the harbour on Clare Island, walking north will take you to an excellent hotel and restaurant, the Bay View Hotel, 098-26307. Further exploration north will take you out to the light House Station, now privately owned but providing some superb cliff top walks. Hill walkers take note, there are some equally superb views to be had when walking west and north west from the harbour and ultimately arriving on the western cliffs of Clare which are immensely high and offer views to many other islands such as Achill Island, Inishturk, Caher island (the holy island and pilgrimage venue) and the Bills, once used as a suitable target for British warships as they represent a size similar to a Battleship or aircraft carrier. Divers have found shells at the base of their cliffs in 30 and 40 metres of water. ARTISTS: I have often taken out individuals or parties to the islands who have spent a day or more in these beautiful surroundings, either staying in the accommodation already mentioned or renting a holiday cottage and using this as their base for a weeks artistic endeavours. WILDLIFE LOVERS: The western precincts of Clare Island and Inishturk provide a superb location for viewing birdlife as their seabird colonies are famous. More on this subject may be found in our section on birdlife. Also to be seen are the seal colonies near Inishshark and High Island and in their largest numbers a little further south in our operational area.